The Rural House “LA TRAMPA” is an old farmhouse situated on the outskirts of the historic walled village of Selva del Camp. A typical rural Spanish family home dating back to the 17Th century. The house has been added to over the centuries showing four different styles of architecture which can be seen in the various materials used over the years. It is believed that the name “La Trampa”, “The Tramp” came from the old stories told by villagers throughout the centuries about the old lane that passes by the house to the river which was used by bandits to waylay travellers and steal their goods. As there are various versions of this story it has yet to be proved. The restoration of El Mas “La Trampa” has been painstakingly undertaken by the family, owners of this beautiful house, taking into account every detail in keeping with the age and original design by using materials from the same era. The antique furniture has also been restared to give the feeling of an authentic Spanish farmhouse. 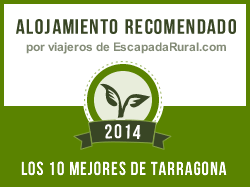 If you are looking farmhouse in Tarragona, in a lovely surroundings, this is your place.